Why Is X So Y? I usually do a Wordless Wednesday on Wednesdays, but this one needs some introduction. It’s no secret that I’m a geek on many levels, including (but definitely not limited to) a math geek and a computer geek. 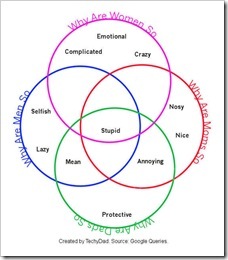 So when I heard that Google was being used to make Venn Diagrams of religious stereotypes, I was intrigued. The basic premise is that you type “Why is X so” or “Why are X so” into Google’s search box. Google will, helpfully, supply you with terms that others have searched on. 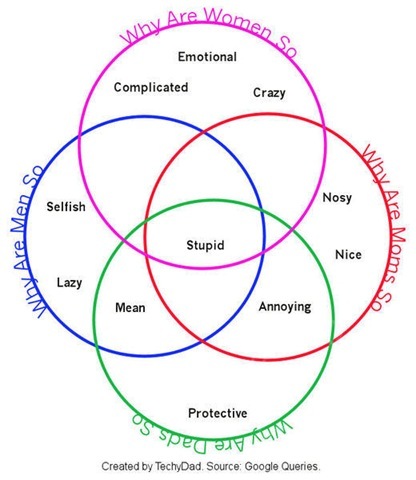 The resulting terms are written down and charted into a Venn Diagram. 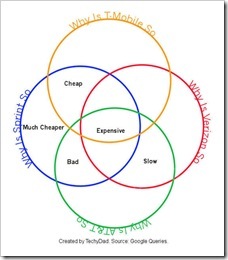 (For the math-challenged, Venn Diagrams are big circles which encompass the terms and perhaps overlap with other circles.) 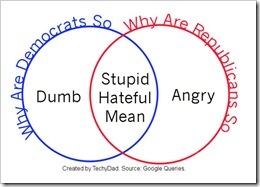 For example, if you were looking to make a political version, you might use “Democrat” and “Republican” and get this Venn Diagram. Of course, all of the terms stated above were made by Google users, not by me. 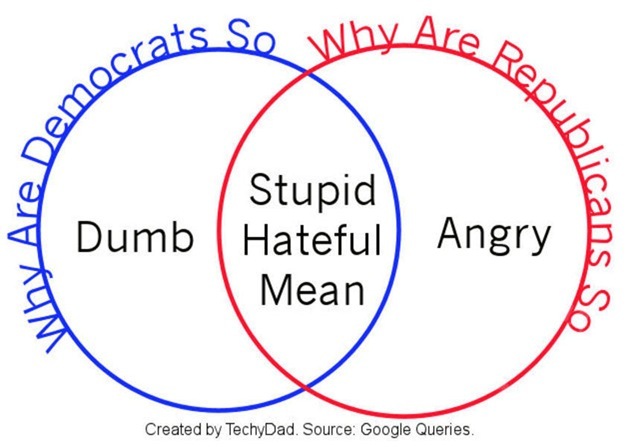 So please don’t pepper me with e-mails, comments, tweets or other forms of contact saying “How dare you call my political party Stupid!” I’m only here to make the Venn Diagrams and perhaps point out some interesting features on them. In this one, I’d say that the searches were likely done by members of the rival parties and that each party seems to describe the other with the same derogatory terms. Around now, the computer geek in me took over and I decided to search for Microsoft, Google and Apple. 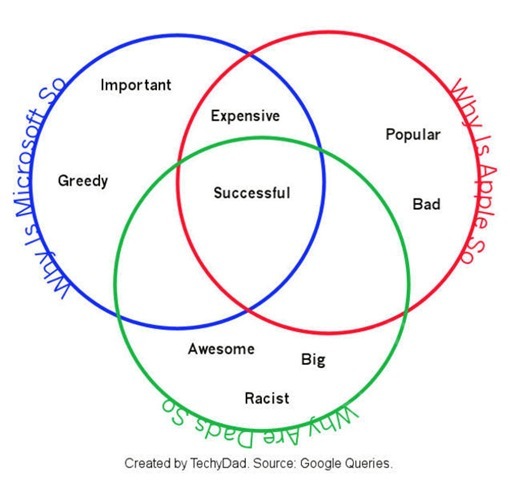 They are all successful (of course), but Microsoft and Apple are expensive while Google is simply “Big”, “Awesome” and… “Racist”?!!! I’m at a loss for that one. Any ideas where that could have come from? 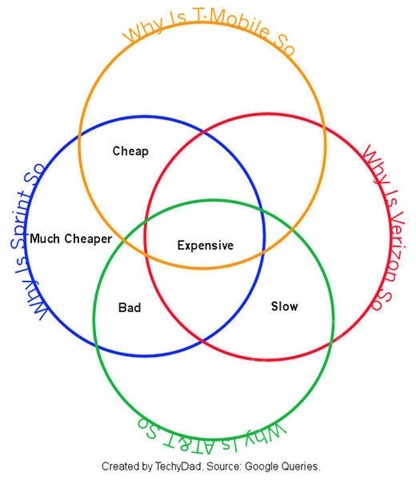 Of course, this led to a comparison of the four major cell phone carriers in the US. This must be the simplest of the bunch. All of the carriers are thought of as expensive. Verizon and AT&T are both seen as slow. Meanwhile, Sprint and T-Mobile are both Expensive and Cheap. The results of these searches were quite interesting. Any ideas on others to do? Perhaps I’ll do a follow-up post. Found my way over here from blogger. 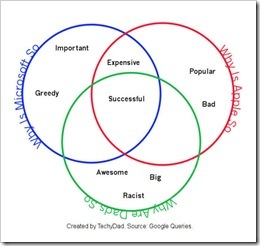 I must say that I’m a fan of Venn Diagrams. Excellent stuff. I’ll be adding you to rss feed for regular consumption.